Just Inklined Hop for June! Hopefully you have come to me from her blog. If not pop on over & start from there, I'm sure you won't be disappointed! there's also a Hers version, which is much prettier! to give away to two lucky commenters! If you want to know a little more about my card, read on! Papermania stamp which came free with a magazine. effect I was hoping for, so I used a flexmarker instead. 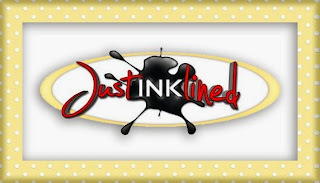 Don't forget to check out the Just Inklined shop! great card for father's day Dawn. Such a gorgeous card, love the papers and the image! You've created a perfect Father's Day card! Amazing coloring! Fabulous Father's Day card, my hubby would love this, he is an avid gardener. Such an amazing card Dawn, I love how you have created the background, with all the different layers and papers, and the image is fabulous. What a fabulous masculine card! Love your design. Well done! Thanks so much for joining us this week at Delightful Challenges! This is a fabulous fun image - love those boots with the left and right on!! Fabulous card, love the image and great papers. Thanks for joining us at Polkadoodles for our Men on Our Minds challenge. This is a perfect Father's day card Dawn, I love your image and papers. Very interesting. I do like the inspiration, as my husband is becoming quite the avid gardener. This is an awesome card, love the subject, the colors are great. Thanks for sharing! Fabulous male card...Thanks for playing along with us at Di's Digi Designs Challenge this fortnight. I love the layering on this card! Fantastic Father's Day Card. Love this image and the colors you chose. Great image, gorgeous papers and love that button and rope. Thank you for joining Charisma Cardz, good luck. Fabulous card for dad, great image. Fab layout and your coloring is Super!! Fabulous card! Love the image. Ohhhh, this is brilliant Dawn! Love the design, and the papers are just scrummy! such a fun image too. Fabulous image and like your distressed edges and button/twin trim -- thanks so much for sharing with us @ My Sheri Crafts challenge! Fab masculine creation, thanks for joining Allsorts challenge, good luck. Great card and well done on the awesome coloring!! All around great card! !